This week I'll be having a quick overnight stopover in London. Instead of lugging along all of my usual bottles of potions, I'm trying to bring as little as possible. It's a bit of a challenge for me as I'm not usually a light packer (far from it in fact)! I'm using this as an excuse to trawl through all of my minis and sachets of products to make my luggage as light as possible, without straying too far from my usual routine. Top of my travel list is my Dove compressed deodorant. Now, I know deodorant isn't the most exciting topic, but we all use it! These bottles last as long as the big ones (I've tested it and they really do! ), but come in a handy travel sized bottle. Next is all the skincare products. I try to save minis, samples and sachets whenever I get them as they'e really handy for trips like this. I've packed a mini REN hydracalm cleansing milk and eye gel, Lancome Bi Facil and some Elemental Herbology moisturiser. 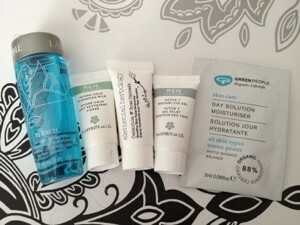 For a night away, I can do without serum, but rest assured it'll be straight back on my face come Tuesday evening! I've packed my mini Batiste dry shampoo for the morning, but have also included a sachet of shampoo and conditioner in case of a hair emergency. One sachet of shower gel and another of body lotion and i'm good to go! The last thing going in the bag are some extra large cotton wool pads. I've worked out how many I'll need for the morning and the evening and added a couple extra just in case. That's me ready to go - what do you pack in your overnight bags? I love the new mini deodorants, so handy! Batiste is always a must and I really want to try some REN products, minis are amazing for travelling! I love these sorts of posts! I personally always end up packing way too many items that I jsut dont need, love that you brought just the basics! I must follow this when I go away next! This is going to sound unbelievable but even though it says you will start seeing a difference in probably 2 weeks time by using xlash eyelash serum. Anyone can easily purchase this product from this website http://www.xlash.net/,i have only used it for 4 days and i have to say my lashes started to grow and they are nearly as they used to be before,they look thicker and fuller. I use it before i go to sleep and i only use a little amount. i am so happy and really can't wait what this stuff will do to my lashes in a few weeks. Absolutely worth every penny. 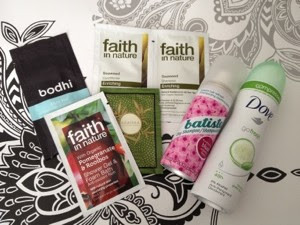 I take mini packs of all beauty products that we need to use daily. Well when I want to go far from the house I take all mini packs in my bag. Now I want to go with my friend Joan for washington DC bus tours . To enjoy this tour I need someone’s help. Anyone here tells me about the best traveling bag that helps me to save my all little things at the time of travel.